Around the world, young dancers dream of joining the Alvin Ailey American Dance Theater. With its signature blend of balletic lines, explosive strength, and constant humanism, the company’s repertory, which has expanded to include new pieces by esteemed present-day choreographers alongside Mr. Ailey’s canon, is highly regarded as among the most challenging and beautiful in the world. Likewise, the dancers who perform it are acclaimed as nothing short of masters. For student dancers at St. Louis’s Center of Creative Arts, the nation’s fourth largest multidisciplinary community arts organization, that dream is about to come true. At the beginning of 2015, COCA announced that acclaimed Ailey dancers Antonio and Kirven Douthit-Boyd would retire from the prestigious company and join COCA as Co-Artistic Directors of Dance this August. Though their resignation from the stage may come as a shock to Ailey fans (Antonio, at 34, and Kirven, just 30, are in their physical prime), the Douthit-Boyds are coming full circle: Antonio, a St. Louis native, began his dance education at COCA when he was 16, and has been an advocate for COCA’s life-changing programs ever since. As the story goes, Antonio came to COCA after stumbling upon a neighborhood dance class. When the teacher saw his potential, she immediately called COCA to see what they could do to support the young man’s talent. Though dance was not an expected career field among Antonio’s peers, he credits COCA with helping him carry the delight of that first dance experience all the way to a professional career. Kelly Pollock, Executive Director of COCA in St. Louis, MO. 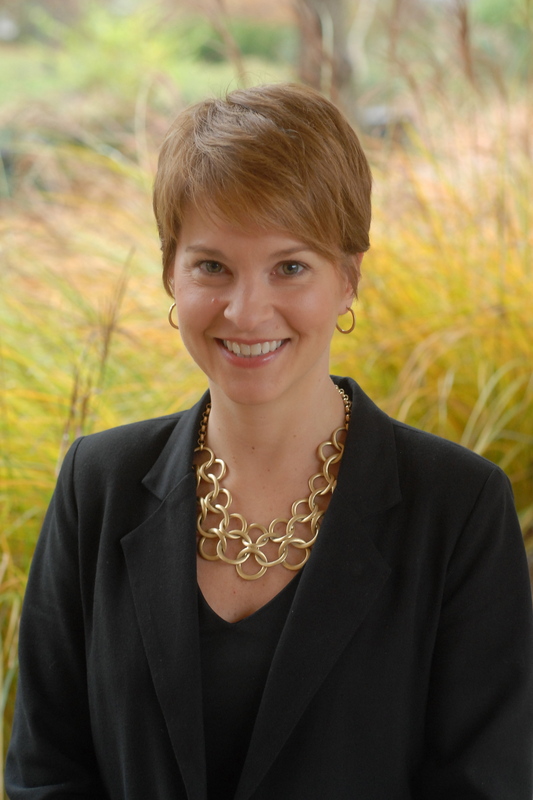 I recently had the pleasure of speaking with Kelly Pollock, COCA’s Executive Director, about the Douthit-Boyds’ transition to careers at COCA, where she anticipates they will be a source of tremendous inspiration for St. Louis’s young dance community. Working closely with students in COCA’s pre-professional division, Pollock hopes the Douthit-Boyds will lead by example, showing these aspiring artists that COCA’s supportive network is ready to help them succeed as dancers, students, and citizens. COCA already serves over 50,000 adults and children every year through its various programs, but considering the duo’s popularity and proven artistic skill, she hopes St. Louis will embrace dance education and performance with a renewed fervor. The Douthit-Boyds and COCA will also almost certainly benefit from the recent spike of public interest in black professional dancers, led by the unstoppable Misty Copeland. Though she was already well-known in the dance world, Ms. Copeland become an international celebrity by consistently speaking out about breaking balletic stereotypes and never shying away from her goal of becoming American Ballet Theater’s first African-American principal ballerina, a feat she accomplished just a few weeks ago when Artistic Director Kevin McKenzie announced her promotion to the company’s highest rank. Just as Ms. Copeland has encouraged countless young dancers to push past the status quo, the Douthit-Boyds are role models for local possibility. COCA serves a very diverse region: in the 2010 census, about half of St. Louis’s residents identified as African-American, and about 20% were under the age of 18. Across St. Louis County, small, independent municipal governments rely on limited resources to fund essential public works with high overhead costs, suggesting there is little money left over for community art programs. 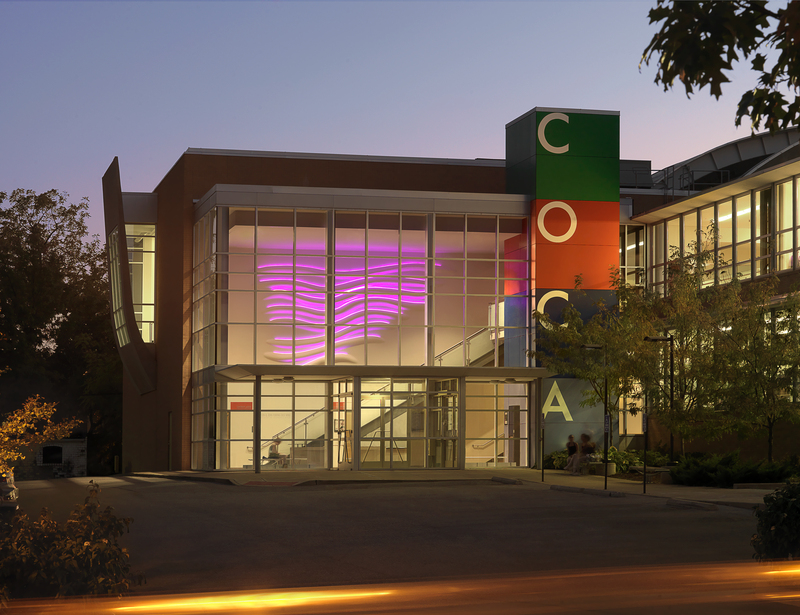 COCA is a place where aspiring students from these underserved neighborhoods can come to explore the arts, and find encouragement from a teacher whose story began just like theirs. Kirven Douthit-Boyd demostrates a movement for COCA students. My full interview with Ms. Pollock continues below. This text has been lightly edited for syntax. Katherine Bergstrom: One of the first things I’m curious about is how you and Antonio got in touch about this collaboration. Who initiated it, who’s idea was it? Kelly Pollock: Obviously Antonio is an alum of the program, and he had a long history of coming back to COCA. For the past 8 or 9 years, when Ailey gets two weeks off in January, Antonio and Kirven have used those two weeks to come to COCA and be in residence with our student companies. They’ve been setting work, setting pieces on our student dancers for many years, and on every visit I hear a little bit of, “Oh, I don’t know how much longer I can dance [professionally].” After several years of this partnership, I told them, whenever you’re serious, and you really are ready to think about that next phase, please talk to me first because we’d love for you to call COCA home. It was about three years ago that it started to get a little bit more serious, and two years ago we really said, “OK let’s do this.” I think I’m still in disbelief that they’re actually retiring at this point in their careers, but we’re obviously thrilled to have them. KB: But I definitely understand their choice to retire at their peak. And then, when they teach at COCA, they’ll still be in pretty good form. KP: And I’m sure that this is not the end of their dance careers overall. While it might be the end of their professional careers with Ailey, I’m sure they will have guest artist spots at Ailey and other places. They’ll continue to move. KB: They’re both fabulous dancers, I’m sure there will be plenty of opportunities for them. KP: I know they’re already scheduled to perform in a piece that Dance St. Louis is presenting* next February. The St. Louis audience will get to see them. KB: What are the foundations of this partnership that you’re creating? What are you going to prioritize? How do you envision this growing long-term? KP: They’ll be coming to focus on our pre-professional dance division, and that’s a program that starts with 9 to 11 year olds. We have a Talent Identified Program where we introduce dance to young motivated kids who perhaps don’t even know that they have a talent, or that dance might be a pathway for them. And then, it moves into our Honors Program, which is a track for 11 to 18 year olds who may want to pursue dance or performing arts as a career choice. Within the Honors Program, we have three student companies: we have COCA Hip-Hop Crew, Ballet Eclectica, and COCAdance, which is our modern/contemporary company. The Douthit-Boyds will have artistic direction over our dance companies, working directly with those advanced students. Antonio is going to focus more on the ballet side, and Kirven is going to focus more on the modern side. They’ll also be teaching classes open to the public, at an advanced and intermediate level. The [student] program is very diverse – socioeconomically, racially – about 65% of our students in the program require financial aid or support services, which include transportation, dancewear, tutoring, career counseling, all sorts of things. We want to continue to grow and evolve that program. COCA is a place that brings together a really diverse cross-section of the St. Louis community, and so we want to continue to grow. It’s really a youth development program, and dance is the vehicle that we use to develop these students. I have no doubt under Antonio and Kirven that artistically we are going to continue to grow and evolve the quality of what we’re doing, and the networks that they will bring will be extraordinary. It creates more opportunities for our students when they leave COCA. They’ll have a bigger network as they go out into the world, and a bigger chance for success. 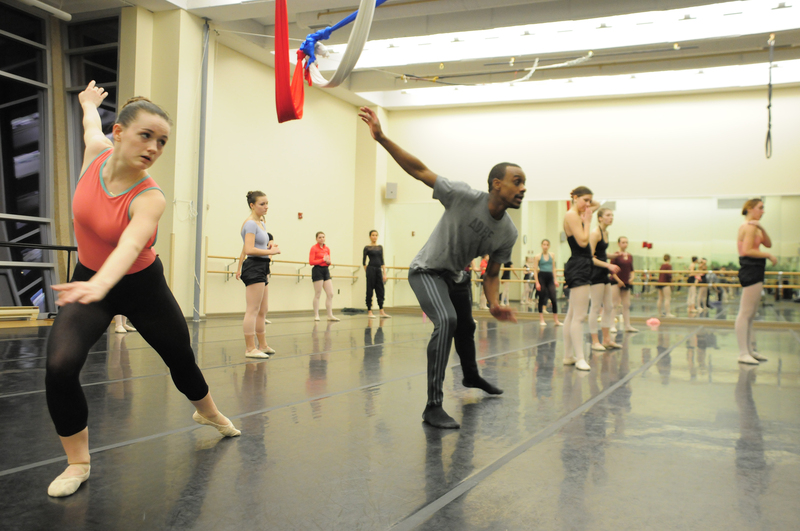 Kirven (L) and Antonio Douthit-Boyd have been guest teachers at COCA for the past several years. KB: That’s amazing, and really exciting! On that idea of a network, do you envision St. Louis becoming the Midwestern hub of dance? Students go to New York for summer intensives, they go to Los Angeles. I went to San Francisco as a student. Do you think this could be the start of people wanting to come to St. Louis to study, maybe even full-time? KP: Absolutely! That’s our hope. Right now we do a regional summer dance intensive audition in January: we have about 200 students from the Midwest who come to COCA, and then we have about fifteen professional companies and university programs that come in to see those 200 dancers and select spots for the summer. We’ve already put the roots down for COCA and St. Louis to be a hub for the Midwest , and as we send our own students to programs throughout the summer, we hope that it will be a destination for others to start coming to St. Louis. We need a little bit more space because our programs are growing overall. We have an extensive summer camp program as well that takes up most of our halls. We do have a partnership with Dance St. Louis, one of a few presenting organizations. There are also university programs. Alicia Graf Mack, who is also retiring from Ailey, is in St. Louis; she’s a past COCA teacher and staff member. She’ll be teaching at Webster University and Washington University. You’ll continue to hear about our evolution in St. Louis. KB: What has the reception been among students, among their parents, and in the general community? KP: It’s been outstanding. Right before we announced in January, (at a big event that we were having), I went into a rehearsal with our students. We had all gathered in the theater, and I I said I had something special that I wanted to share with them. I told them that while they knew that Antonio and Kirven come back each year, the next day we were going to [publically] announce that they were calling COCA home, and that they were so important as students that [the Douthit-Boyds] made the choice to come. Elation went through the theater, they were screaming. I have had nothing but positive, overwhelming happiness about it, because not only are they amazingly talented artists, when you get to know them as people, they’re just amazing human beings. They’re going to be great mentors, they care deeply. They have great relationships already with our students and families. I think the community at large knows how special it is that we have the opportunity for them to call St. Louis home. St. Louis is known for being more of a sports town, but were hoping to make them the new rock stars of St. Louis. KB: Do you have any plans for how the program might attract new people? I’m sure when people hear Ailey dancers are teaching at COCA, they’re going to want to come take classes. Do you have an expansion plan? KP: We’re looking at that. As I said, our facility constraints are one thing that we’re tackling. We have a mixed income model at COCA. We have this pre-professional program that I described; those students are there six, seven days a week, they’re taking nine or ten classes a week, they consume a lot of the building. But we also have very extensive recreational and beginner programs for all ages and all skill levels. We want to make the arts accessible to everyone. Balancing that is the challenge: how do we keep the pre-professional program growing when, at the same time, we need to expand and grow the recreational programs? That balances includes tuition, as well. We are going to be looking at new partnerships with organizations in the area. That also means finding new resources, so there are fundraising efforts involved as well. The community is very excited about what’s ahead, and I think they realize what this means, not only for dance and the arts but for the community at large. COCA has an approach that’s been working quite well over the past many years. It’s been a hard year for St. Louis. This is a success story of what’s going on right in St. Louis, and I think the more that we can shine a light on it, the better it’ll be. It’s what the community needs, it’s what our students need, and I think more success will come of it. KB: Going off of that, one thing that I’ve noticed from following the presidential campaigns is that everyone is talking about strengthening American families and communities. I know you’ve addressed the NEA about how COCA is doing that. Is there anything that you would say to people who are skeptical about the role of arts in strengthening community, or maybe politicians, either local or national, who haven’t thought about the arts? KP: We see this all the time. We have students from very low-income situations, below the poverty line, definitely. For many of our kids, what COCA represents – what dance or theater represents – is a possibility. To have someone like Antonio, who came from these circumstances and was a beneficiary of the program and the support services, as an example, they know achievement is possible, and you can come from anywhere. What we try to do is level the playing field so that kids have opportunities. They’ve put in the hard work and the discipline needed to get there. For a lot of students, they may not experience anything outside a 10-block radius of their home. To be around kids from other circumstances, other backgrounds, to know that they can go to college and have a post-secondary plan, is important. Dance is a vehicle to get there. It’s about engaging kids in learning, about giving them a sense of joy and hope. We’ve seen it happen again and again. The arts transform lives for a relatively small investment. We have alums all over the country now, and I don’t know that they would be where they are today if it hadn’t been for all those programs and their time spent at COCA. I’m a firm believer that a small investment in arts programs can make all the difference in a kid’s life. KB: How many students are in each of the three dance companies? KP: In our pre-professional division we have about 300 students. In addition to the three student dance companies we also have Allegro, which is a vocal ensemble, and CTC (COCA Theatre Company), so there are five student companies overall. Some companies have junior companies as well. Every one is a little bit different each year, but there are about 60 kids in each of those companies. KB: Do students ever join more than one company or is each one pretty focused? KP: They join two. I think some of our students, if we let them, they’d want to do all five. But, it’s a rigorous program and it requires a lot of time – a lot of rehearsals, a lot of classes. They also go to school, and there just aren’t enough hours in the day to do everything and have a little down time. Many of our students do participate in two companies, though. Some are in hip-hop and ballet, which is an interesting mix, and some do the vocal ensemble or the theater company with one of the dance companies. As the theater program has evolved, we have more and more students who are spanning the performing arts. We have current alums on Broadway – in fact, tonight we’re going to see “The Audience” with Helen Mirren, and one of our students, Elizabeth Teeter, who takes dance with us, plays the Young Queen in the production. She’s just at the beginning of her career and quite talented. We tell our kids all the time that a very small percentage are going to go on to professional careers, and that it’s very competitive. It’s a tough field. But the skills they learn through the arts – in terms of having confidence and the ability to communicate and think on their feet, being perseverant and having the grit to get through, being a problem-solving – that will carry them through any career that they choose. We’re focused on helping each of them pursue their dreams and giving them all the skills to get to wherever it is they want to be. There are kids coming out of the woodwork in terms of talent for theater and dance, so it’s been fun to have a multi-disciplinary organization that gives kids lots of options. They know that a career in dance on the stage is not the only possibility. There are commercial outlets, too. Or, you can work in marketing or public relations. We’ve been working with the Ailey PR team and one of our alums, Lauren Morrow, who came through our dance program, is working on that team. It’s another remarkable angle to our whole story. Our alums are not just on the stages, they’re also in the arts administration world, across the field. This passion is within them; once a dancer, always a dancer. It’s in their blood. It’s exciting to see our network growing. Our alums have become a very tight-knit family. [They] continue to come back every year and give back to the students that are in the program, so I think that whole cycle will continue. 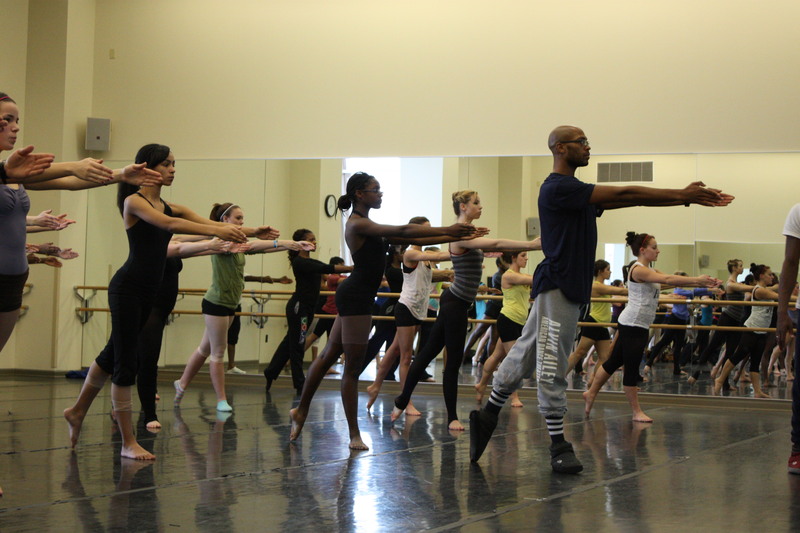 Antonio Douthit-Boyd began his dance training at COCA, and is an advocate for the organization’s supporting programs. KB: I also want to ask you about leadership. You’ve been with COCA for a long time, in a couple different roles. Leadership can take a bunch of different courses: there are leaders who focus on a financial health, leaders who focus on community engagement. What has been your focus during your trajectory? What have been some of your techniques? KP: I have been at COCA over seventeen years now, so it’s been a while! I came through first and foremost in the development side of the organization, so fundraising has always been a throughline for me, talking about the many programs that we offer and our scholarship and support services. It takes a lot of resources, so I do spend and have spent quite a bit of my time at COCA helping to generate those resources, building external relationships and networks so that we can get people engaged in the mission and hope they choose to support us. Advocacy is another part of it, taking the opportunity to talk about not only the work COCA is doing, but the importance of arts education, of STEM to STEAM education in schools, and the variety of the creative thinking and critical-thinking skills that the arts provide that we know are necessary [for future success]. I’m making sure this is a message and a platform that’s out there. I think my role overall has been the strategy behind [COCA]. We’re a multi-disciplinary organization, so we do have discipline directors in dance and theater and so on. We have many different types of programs, from classes in our studios to programs in schools. We’re even working with the business community. Part of it is finding the balance and the blend of how much you can focus on, what you have to be great at, what you can afford to step back at, and how you market your work and get your message out. I think I’ve been [at COCA] this whole time because it continues to be a fun challenge, and I’m still learning. It’s a dynamic organization that’s evolving and changing, and we’re focusing on growing our impact in the community. It’s not an organization where we can sit back and rest on our laurels. Status quo isn’t really an option that we consider. We have ambitious goals and and we really want to see them continue to grow in St. Louis. We’re making a case for ourselves, and making the arts and arts education shine a little bit brighter. It’s competitive. How can you have [the community] hear your voice, and make the organization stand out from other [community] causes? In terms of leadership, it definitely requires getting people excited about what’s happening and telling our story, so we continue to do that! KB: The Douthit-Boyds start at COCA in August – anything planned for those first couple months, as far as celebrations or other events? KP: Oh yes! We haven’t even shared everything with them yet, it’s so busy with rehearsals and performances. The first week they come in is company auditions. Literally the first day that they’re there, they’ll be watching all of the students and selecting the companies for the year, so they really hit the ground running. On their very first day, we have a “Welcome” party for our Leadership Circle, for our donors to come and welcome them. We’re definitely going to be keeping them busy! I think they have a vision that it might be a step back from the current rigor of their jobs, but I have warned them that for the first several months we have a lot of things planned. It’s because people are excited. People want to get to know them, they want to welcome them to the community. We want to have a gathering of the dance community and the arts community in St. Louis. Our donors are excited. Our students and our families are excited. They [the Douthit-Boyds] are excited about their first home – they’ve been talking quite a bit about that, so we do want to give them a little bit of time to spend there. We want to welcome them into our community with open arms, so there will be a lot of activities as we go into fall. KB: That’s great! So now, how do you feel about this? I’m sure you’re excited, but do you see this as one of the hallmarks of your career? KP: I do! As I said to someone the other day, I’ve been at COCA for many years, and I’ve seen just amazing things happen. I’ve seen the organization grow and evolve, and how that has impacted our students. If I do nothing else, this was a really good thing that I’m glad we were able to make happen. We have a lot of longevity on our staff, and the staff is just really excited to have [the Douthit-Boyds] come on board. It’s such a commitment that they’ve made, to make this move. The timing could not be better, in terms of where the organization is and where St. Louis is. The influx of energy that they’ll bring to our organization and community is outstanding. I think we have a good three to five years here of figuring out how we can grow. I’ve told them for the first year to just listen, absorb, and learn because it’s a big transition for them and I want to make sure they feel great about it. After we get through our first year we’ll sit down and plot out what’s next and how we take it to the next step. It’s going to be an exciting year, so check back soon to see what’s new. We’re looking forward to August; it can’t come soon enough. Learn more about COCA and its wide variety of community programs at cocastl.org. *Dance St. Louis is holding open auditions for adult dancers to join the Douthit-Boyds and fellow Ailey company member Alicia Graf Mack in this new piece by Dianne McIntyre. 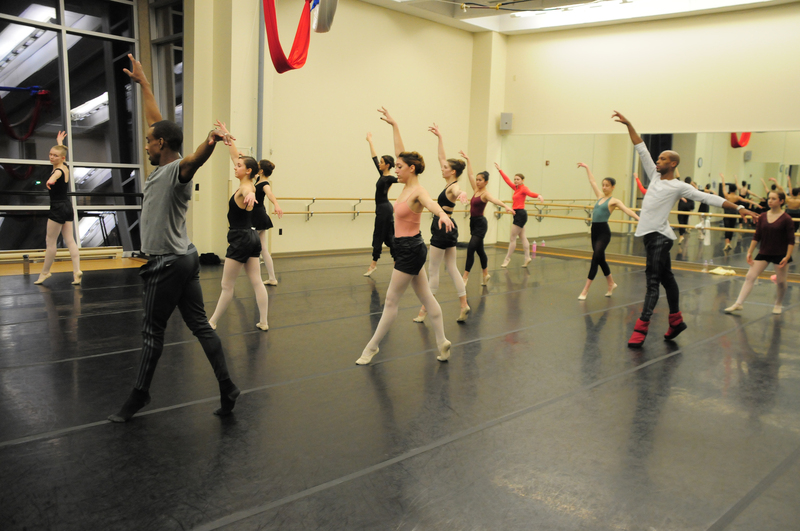 Click here for more information about the September audition workshops.